From earliest recorded times Drumahoe, surrounded by the valleys of the famous Faughan River, has been a place where paths have crossed on the way to the river and Lough of the Foyle and the ancient sites at Enagh Lough, Grianan and on the island of Derry. In the bloom of spring small birds do sing all along the Faughanside"
The bridge at Drumahoe is still there but it is very difficult to recognise Willie Bratton's happy scene with the ever intrusive demands of the expanding city and attempts to absorb Drumahoe -'Drumahoe' - in Gaelic 'the ridge of the cave' or 'the ridge of the crop', which does make some sense as the valley created by the Faughan does make a hollow, cup-shaped ridge as it winds its way into the valley of the Faughan and made 7 churches there. The nearest church to Drumahoe was probably at Clooney but there is some evidence of early churches at Ardmore, Enagh and Rossnagalliagh. During the Siege of Derry of 1688-89 Captain Thomas Ash of Currynerin (now Ashbrook) served with distinction in defence of the town and kept an important diary of the daily action. The Rev. James Gordon of Glendermott Presbyterian Church greatly encouraged the young apprentices when they resolved to close the gates of Londonderry and he later took active part in the Siege. There is no record of any Siege related activity in the Drumahoe area but it is certain that the cattle and crops were seized by both sides and armies passed through the area to participate. Colonels Mitchelbourne and Murray, two leaders of the defence, are buried at the old churchyard in the Glendermott Valley, where Apprentice Boys annually pay tribute to their memory. It is believed that during the Penal Times of the 18th Century, Roman Catholics conducted services in the woods at Ardmore and at the Fincairn Glen, where they were protected by some local Protestants. I can recall watching the fires that were lighted on the hillsides of the Glendermott Valley on the first day of May (a survival from Pagan Days) - in the winter we enjoyed sleighing and skating. On Church Brae when the snows lasted large crowds came from the Waterside to enjoy sleighing. 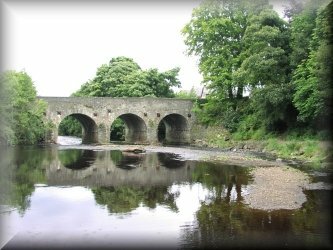 On rare occasions - in 1895 particularly - the frost was so keen that the River Faughan was frozen over and I skated all that winter on the thick ice covering the river, from the weir at Glendermott to the mill at Upper Drumahoe. There was good smooth ice through which I could see the salmon swimming in the water beneath...." a forgotten, idyllic age! He attended the Faughan Bridge School at the Bridge, where integrated education was the norm before it became popular elsewhere. Incidentally this school was the 'alma mater' of renowned men such as Thomas Gallagher, the tobacco manufacturer and Senator Baird of President Roosevelt's famous Cabinet. The school was later used as the Scott Goligher Memorial Hall and was demolished recently. 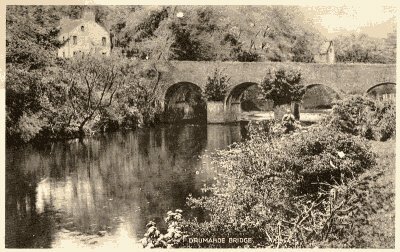 The Drumahoe area was particularly renowned for its mills, utilising the natural resource of the river. 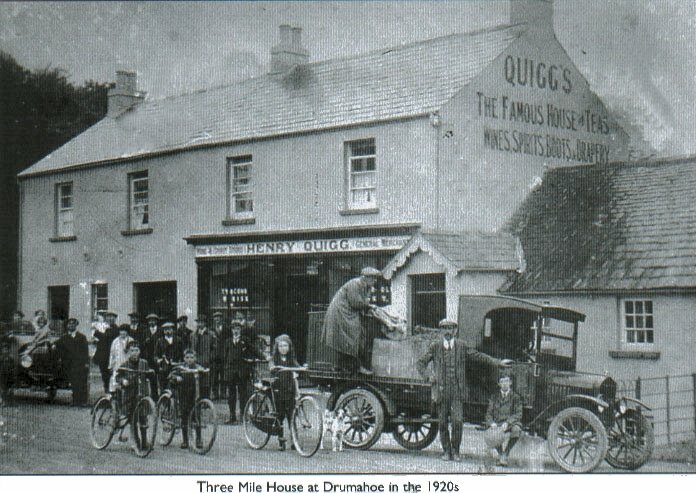 In the early 20th century over a dozen mills prospered in the area - the most famous being Clarke's at Drumahoe House and at one stage the mill provided electricity for the Drumahoe area. These corn and flax mills are long gone and, for a time, were replaced by new industries like Desmond's shirt factories and others. They hale also gone and have left an unsightly scar on the landscape! Some reclamation has taken place and a new drainage system has dried up old burns and lowered the level of the Faughan, while new housing has brought considerable pressure on existing facilities and the threat to the village atmosphere continues to grow steadily.